What a contrast! 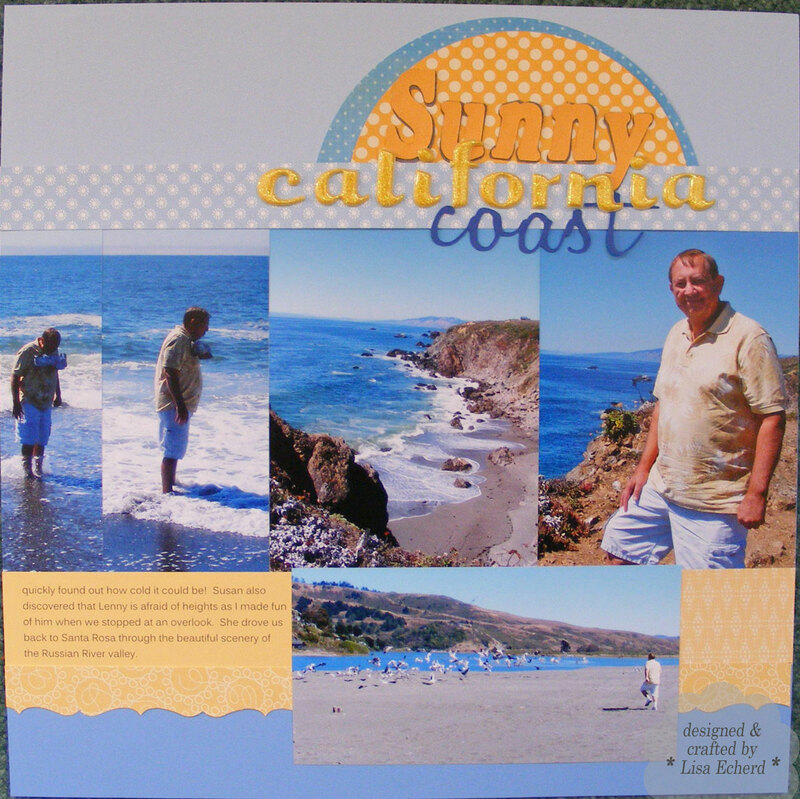 Last week I shared a layout of the sunny California coast. I used bright blue and soft yellow colors to pick up the colors of the sky and our clothing. While I know that was an atypical day for them, it created quite a contrast for us. One of my favorite photos from the entire trip. I used Photomerge in Photoshop Elements to put together two shots of the coast taken from the bottom of a twisty, steep trail my husband wanted to try. In this layout we have moved further north to just above Trinidad and the coast closest to Redwood National Park. 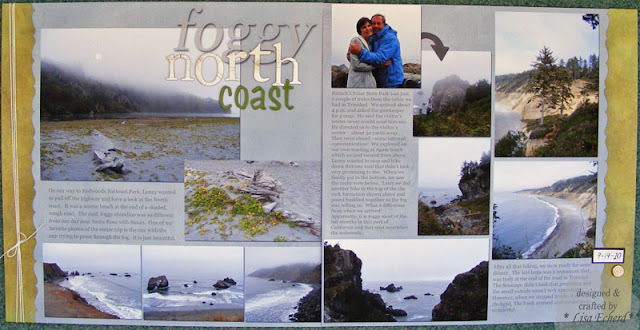 Apparently the climate in this part of California is often foggy especially in the late summer and fall. The fog provides provides a mist that nourishes redwoods. We got just a little glimpse of a clear coast when we went to one of the state parks later in the afternoon. 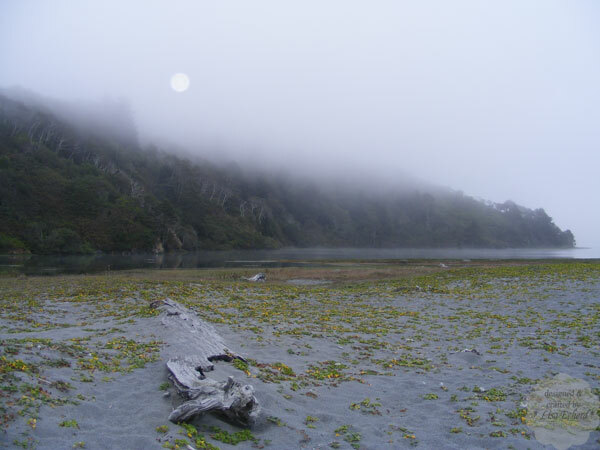 However we weren’t there very long until the fog rolled right in. It really is beautiful just in a different way than the sunny day we spent on a Sonoma County beach. 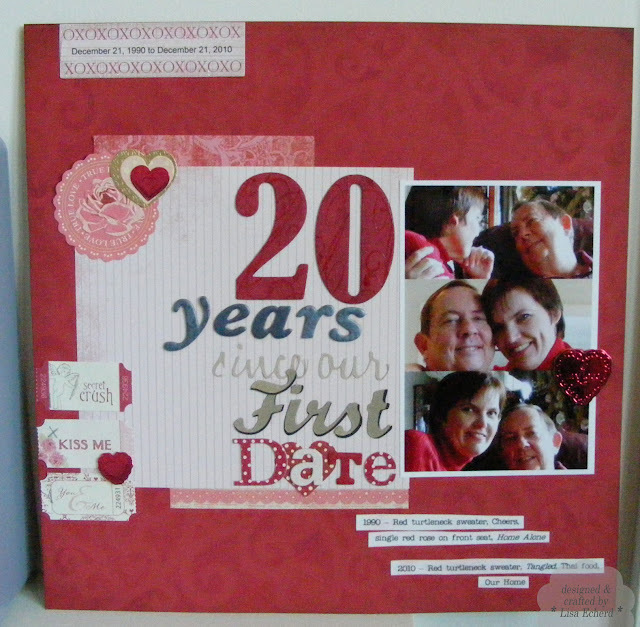 · I just could not find enough of the right paper to go with these photos. Also I knew that I would need to reprint many of the photos from the 4x6's I already had. This seemed like good layout to do digitally. However I did have some great Thickers and chipboard letters to use for part of the title. · Foggy has been added when creating the digital layout. 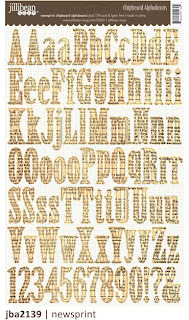 After printing I added the chipboard letters. 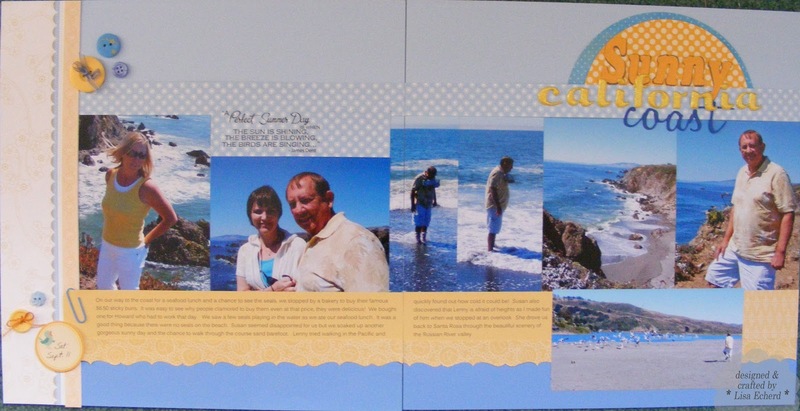 · I did use one paper that looks great with these photos by adding strips of border punched paper to each side. 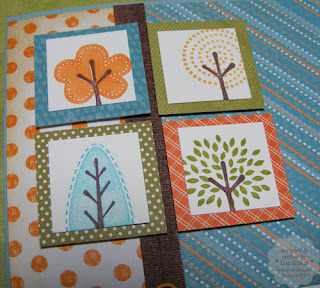 When working with Trendy Trees set, I always seem to use lots of colors and have to use the Stamp-a-ma-jig so it pays to make several cards at a time. I did a few of these yesterday for our birthday stash and for OWH. I think they make good masculine cards. That Sweet Pea DSP just keeps on giving. The center piece of brown is Close-to-Cocoa stamped with Chocolate Chip from a new set of 'stitching stamps' I picked up. This is supposed to look like grosgrain ribbon. It gives a nice little tone-on-tone visual texture. 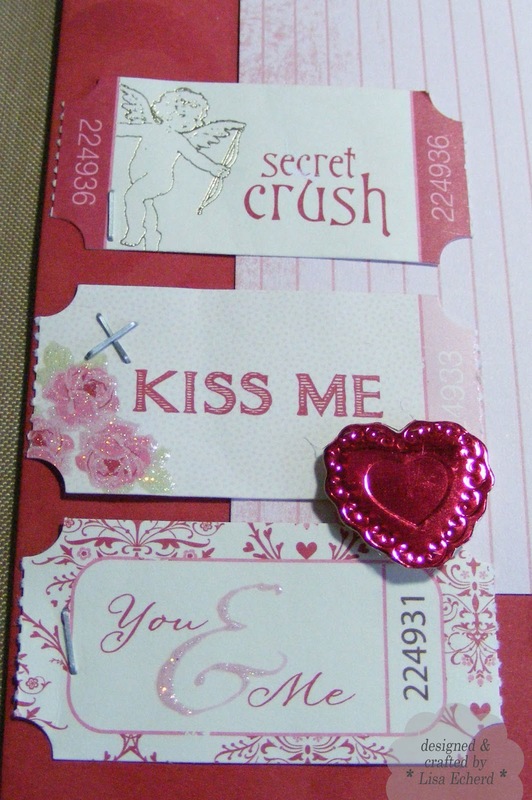 The layout is from Splitcoaststampers sketch challenge this week. I flipped it on its side and stamped the trees purposefully off center. 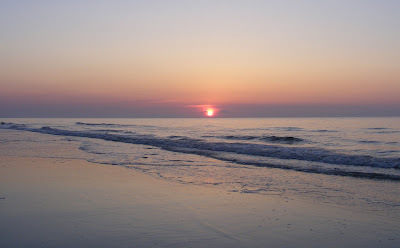 It's a rainy Friday here in NC but we are hoping for a pretty day tomorrow. My Mother and I are planning a little shopping trip in Charlotte. She is fun to shop with as she has such wonderful and somewhat unconventional taste. We are both the type of shoppers who can cover a lot of ground in a little time. We can walk into a store an instantly decide if there is anything that will be of interest. My favorite thing is spotting something unusual for her that she might not otherwise have purchased. DSP: Sweet Pea by SU! The random comment number chosen was "2" that is Mary! Mary, please check your inbox and respond to my message requesting your mailing address and the package of paper, ribbon, etc. will come your way. 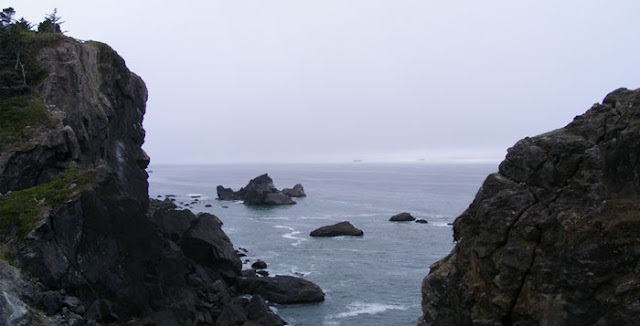 Apparently getting a sunny day on the northern California coast is a matter of luck. We were certainly lucky last September. I've been watching Nichol Magourik's videos each week on Two Peas in a Bucket's YouTube channel. 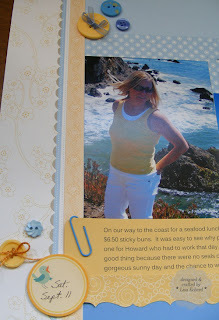 She is doing a scrapbook page from "Start to Finish." 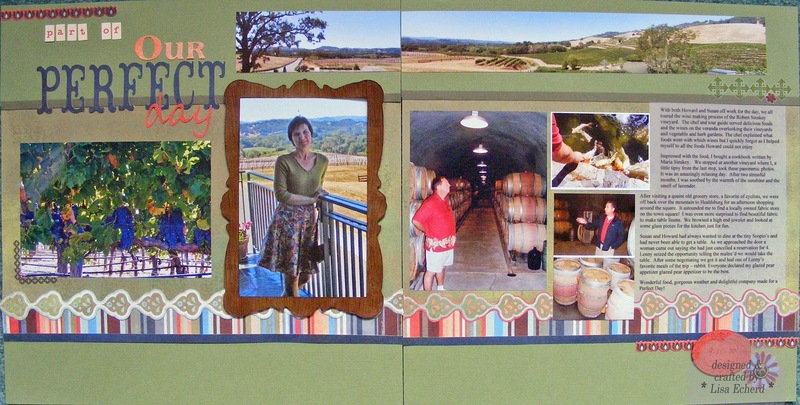 My two page layout is based on one of her layouts. I just love the half circles for anchoring the title. They really made this one. I also took the vertical border from another of her videos. A band of photos really keeps the focus on these shots of our bright and sunny day at the beach with our friend, Susan (shown on the left). I just loved the expression on Lenny's face when he tried wading in the Pacific. I knew that water would be cold so I just walked through the course sand and explored a little. As I mentioned yesterday, I seemed to be hooked on spritzing. 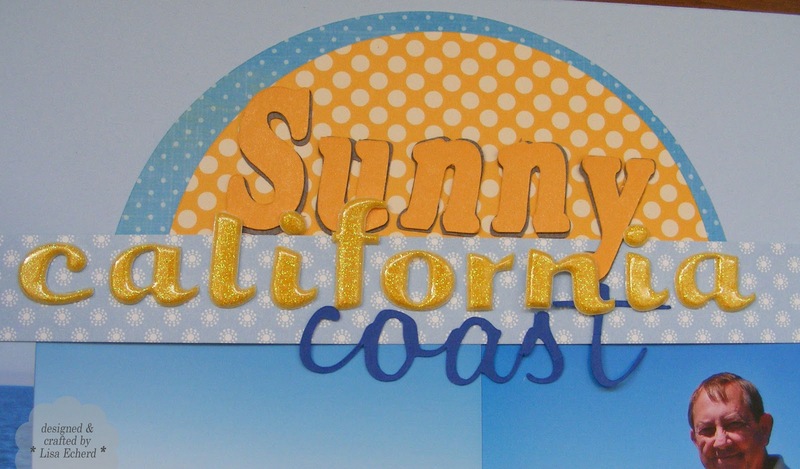 After cutting the 'sunny' title on the Cricut in cardstock, it looked a bit dull compared to those glitzy Thickers, so I spritzed the letters with iridescent gold Angel's glimmer mist. Thanks for visiting with me today. Be sure to leave a comment on Monday's post - linked here - for a chance to win my blog birthday candy. Comments must be posted by tonight at 9 Eastern time. 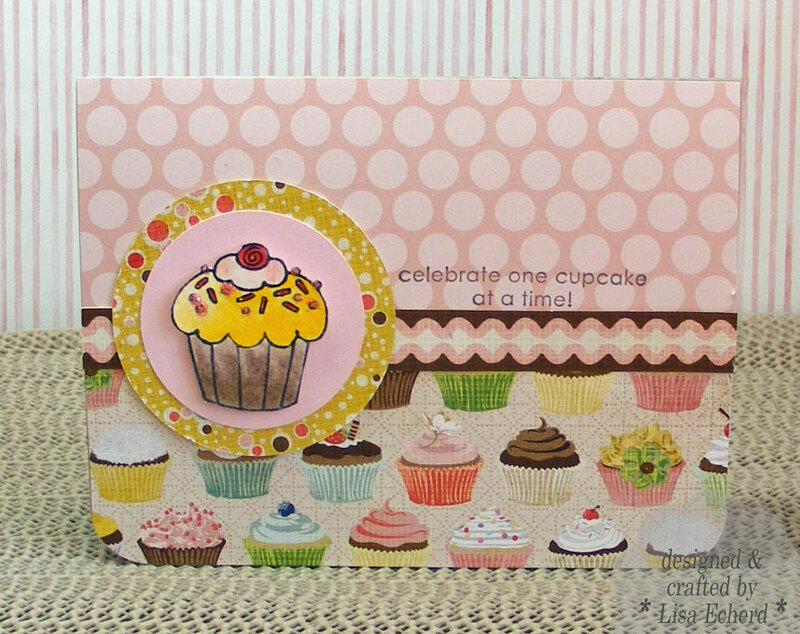 Ingredients: DSP: Delicate Dots by Stampin' Up! Lately, I've been obsessed with spritzing! 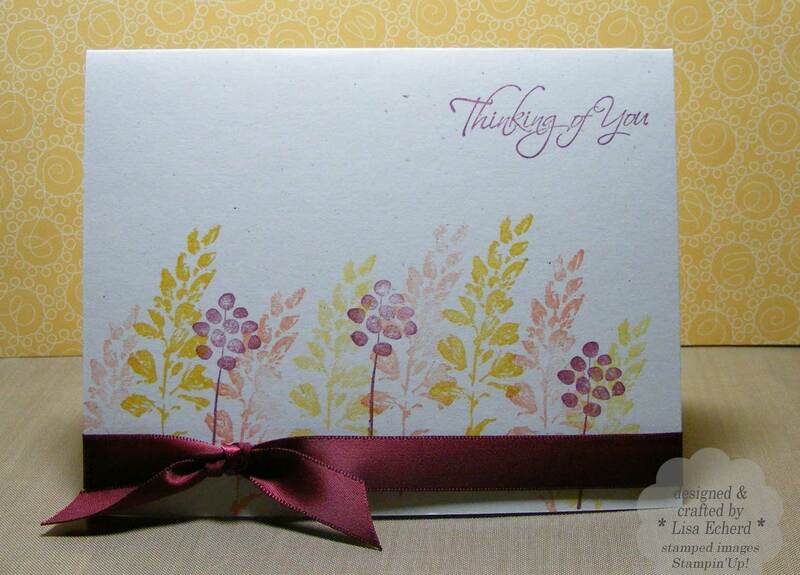 Splitcoaststampers color challenge this week is to use Rose Red, Always Artichoke and Perfect Plum. I played with my watercolor crayons. For part of the stamped image, I colored the stamp directly with watercolor crayon and then spritzed with water. I stamped on watercolor paper. At first I thought I'd have a mess but it dried nice and, well, watercolor-like. I used some regular ink to stamp the complimentary images. I didn't have any Rose or Plum ribbon but I did have some Rose Red spritz I had mixed up over the weekend in some of my experiments. I wanted to see if you could create a mist with pigment (Craft) ink and water just like you can with dye (classic) ink. You can, it doesn't spritz quite as smoothly since the pigment ink isn't as water soluable as the dye ink. Still it does the job. So for the "ribbon," I ripped off a piece of muslin and spritzed it thoroughly with rose red mixed in water. After drying, the ink does not come off on your hands. Of course this would not be waterproof so it is fine for papercraft projects but not for any fabric projects that are going to get wet. Thanks for visiting today. Be sure and leave a comment on Monday's post for a chance at blog candy! The giveaway ends Thursday evening, Feb 24. My friend, Judy, always decorates the inside of her cards. I used her idea to help me out of a little jam on this design. 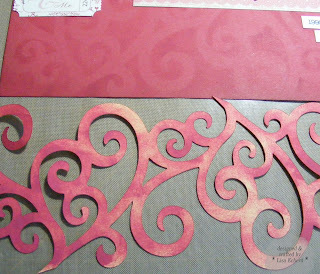 use up a little extra of your main pattern paper or a coordinating paper. 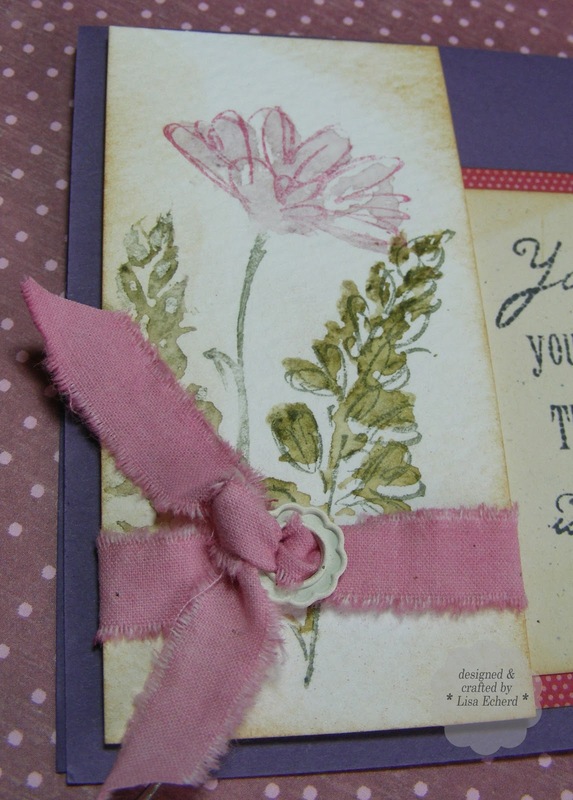 stamp a complimentary image - such as a small flower from the same stamp set as you used on the outside of the card. stamp really small images that don't seem to work anywhere else. I have some 'bargain' stamps I got a couple of years ago which are really small and should be colored in if used on the front. 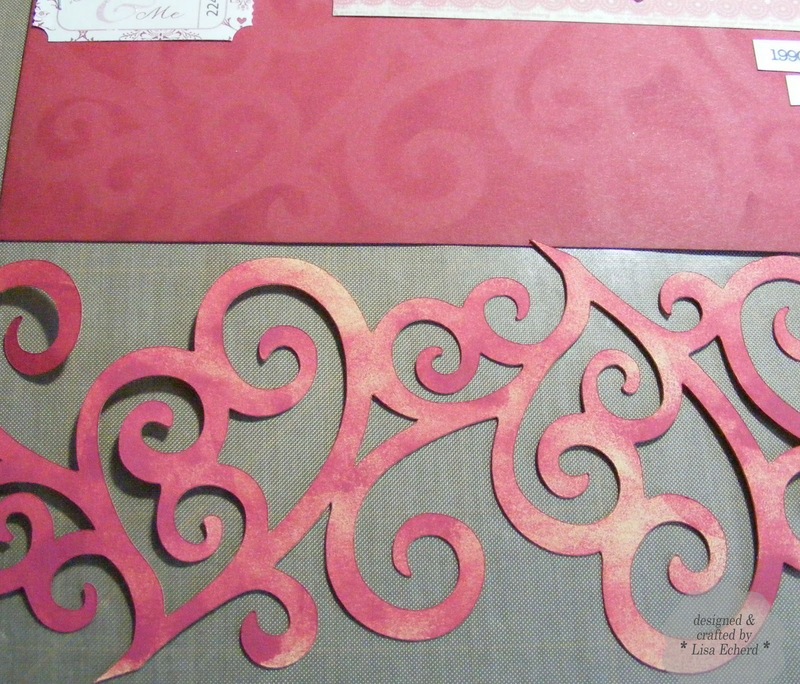 I can use them on the insides of a card or the envelope for an extra touch without taking time to color. 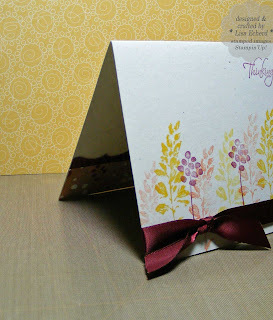 create a pocket to hold a gift card. 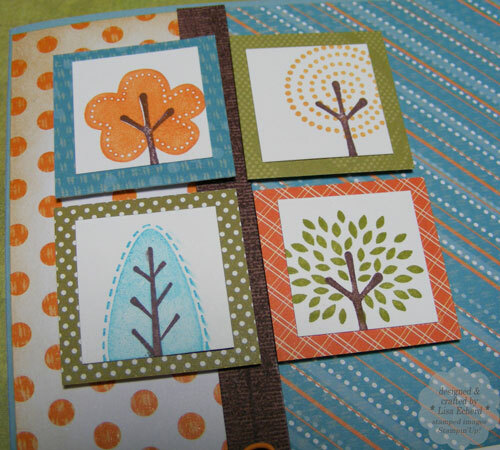 add stickers or other flat embellishments that accompany your papers. I always seem to have a few cardstock stickers left I'm trying to use up. Thanks for visiting today! Be sure to check out yesterday's post for a chance to win my blog birthday giveaway. Cardstock: Scarlett Jewel by PTI; Naturals White by SU! Ink: Scarlett Jewel; Crushed Curry and Groovy Guava by SU! Two years of blogging! I just love posting and reading other blogs. To celebrate, I'm doing a little giveaway. We have to call it a 'giveaway' and not blog candy. The first time I won blog candy, my husband was distressed to learn that no actual candy would be coming our way! He doesn't understand that to crafters pretty paper and ribbons are just as good as candy - and non fattening. Making Memories Passport trims. 6 yards of gorgeous ribbon I'm forcing myself to save for one of you! Comments must be left on this post by Thursday, February 24 at 9:00 p.m. Eastern time. I hope you will take a moment to look around a bit and hopefully come back for another visit. I love to have visitors and comments. Thank you for reading my blog. I'm grateful for all of you. My husband has asked me several times already, "Where are we going this year?" "When are we going....?" It's funny that I was always the one who traveled and had to talk him into taking time off for a vacation! The first long trip we made together was to California in the early 90's. I thought he would faint when I told him what the plane tickets cost. I think they were about $350 each. He had only ever been on one or two vacations in his entire life. He soon found out that travel was one of my passions and he has apparently gotten the bug, too. I'm still the travel planner so I guess I'd better get busy planning some things. We are very fortunate to be able to take some trips. So with travel in our minds, I got back to our California pages. I'd done the lead in for this wonderful day a few weeks ago. These photos and journaling provide the details. When I read my journaling, it seemed like all we did that day was eat and drink! I hadn't even mentioned the ice cream. We enjoyed the scenery, company, weather and browsing stores, too. It was just lovely. It inspires me to plan our next adventure. For these pages, I used Basic Grey's Marrakech collection. 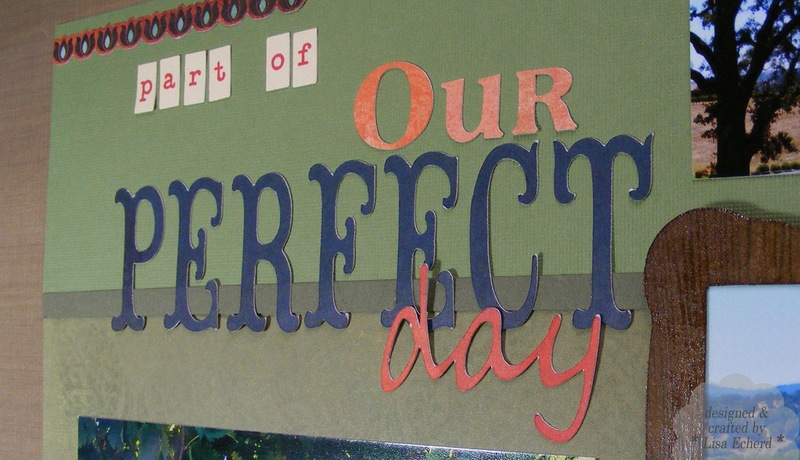 The photo frame is cut on the Cricut from a frame I found in Photoshop Elements and imported into SCAL software. 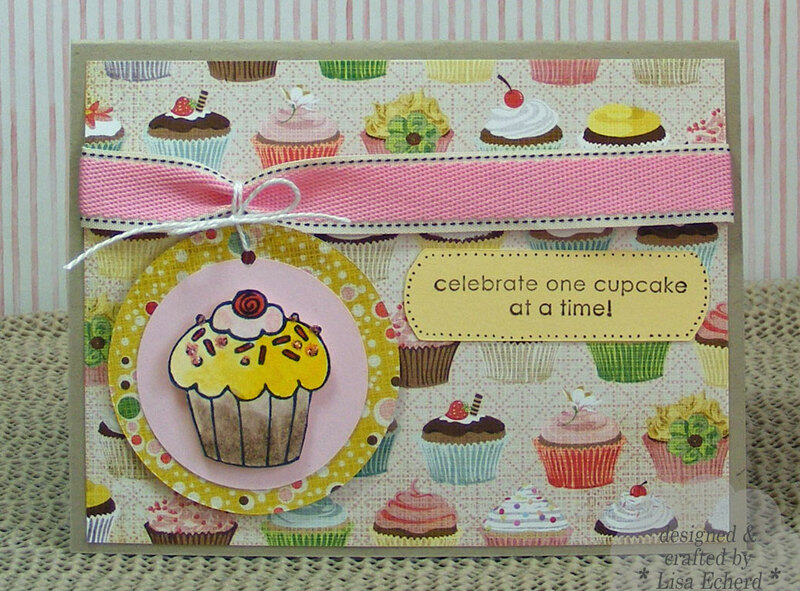 I stamped it with a woodgrain stamp and painted on Glossy Accents. Some rub-ons and stickers helped finish up the two page spread. 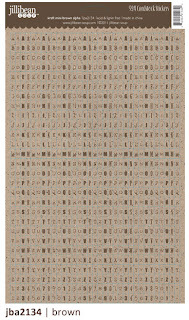 The date is written inside a stamped frame. Brad: Vintage from Stampin' Up! We may be pushing spring around here a little bit. Who cares, the weather is gorgeous and haven't we all earned a little sunshine? Yesterday, my husband and I went for our first hike of the new year. It was so warm! Earlier in the week, we made this Easter card during our card class. 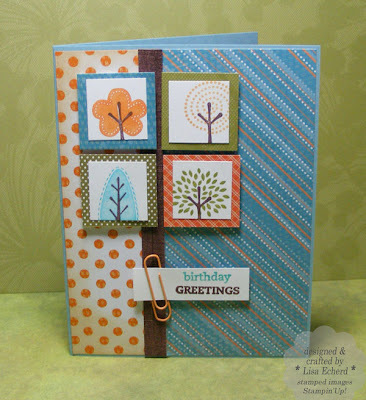 Our card class this month focused on using small stamps. 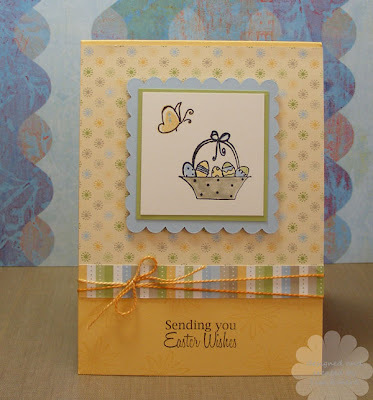 This traditional layout uses three very small stamps - the basket and butterfly within the frame and a tiny stamp repeated in the background at the bottom. We looked at several ways to create multiple colors on acrylic stamps. I find using markers directly on acrylic stamps to be iffy at best. They don't seem to respond the same way to marking, huffing and stamping that rubber stamps do. So to color the butterfly, we stamped the image in So Saffron ink and then drew the outline directly on the paper with a fine tip Zig marker for an outline. The basket was stamped in Staz-on and colored in. If you've earned some pretty weather this weekend, I hope you'll get a chance to enjoy it! DSP: Delicate Dots from SU! It's been awhile since I got in a card challenge. 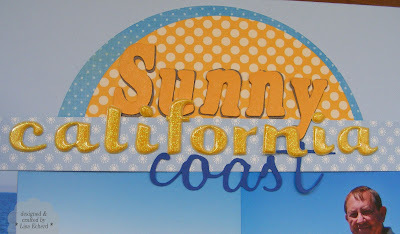 This card is for two challenges at Splitcoaststampers. The color challenge this week is to use Pacific Point, So Saffron and Wild Wasabi. I have none of that green in paper or ink so I used just a touch of Garden Green and there is a little green in the twine which was the desert option for the challenge. What I found most difficult was the sketch. Sometimes, layering simple rectangles gives me the most grief. I got all my colors in on one layer and then found it tough to make the rest work without being overpowering. 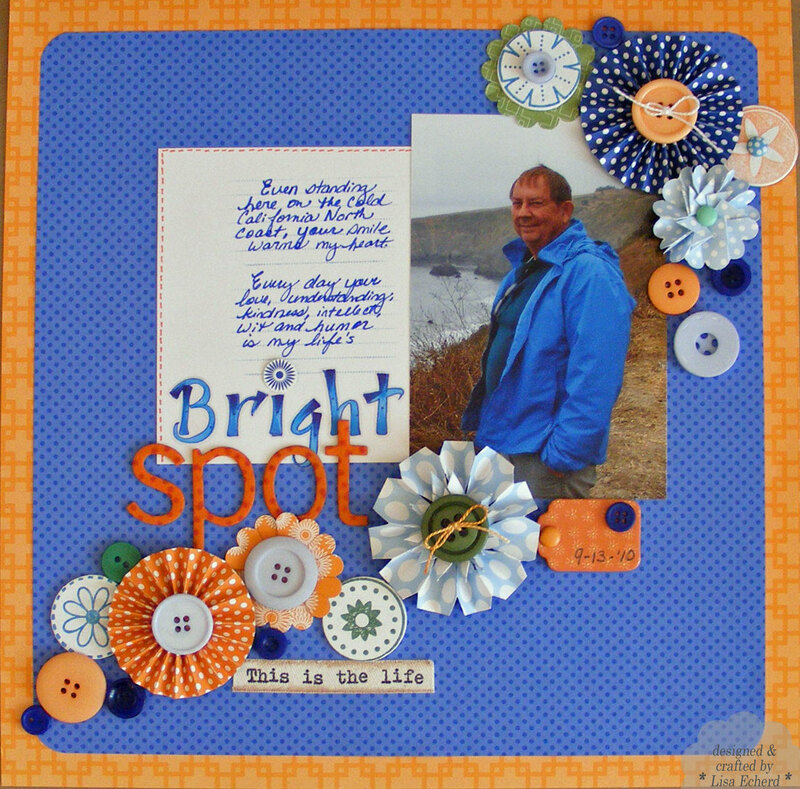 I'm really pleased with my tone-on-tone square stamped directly on the background. I created a mask with a rectangle cut out and then stamped inside the rectangle. Faux stitching in the same color ink finished it off. I'll have several other cards to post in the next few days. We have card class tonight focusing on using small stamps. Better get set up. Even with digital cameras and instant viewing of the photos we take, we sometimes don't get the right photo. When you have a collection of less than perfect photos, try cropping and using smaller versions of several. A bunch of OK photos may equal one great look. On the 20th Anniversary of our first date, we were going to a movie just as we did on our first date. However, this time we were running late. I hurriedly set up the tripod and we took a few shots. I knew they weren't that great and they looked worse when I got them on my computer. We needed our heads angled differently, there was one where I looked good and Lenny was looking away. Just nothing was quite right. Still I can't recreate the day and there is only so much my Photoshop skills will fix. So rather than having one 'not so great' large photo on my page, I opted for a photo sequence of several photos - like a strip from one of those photo booths. 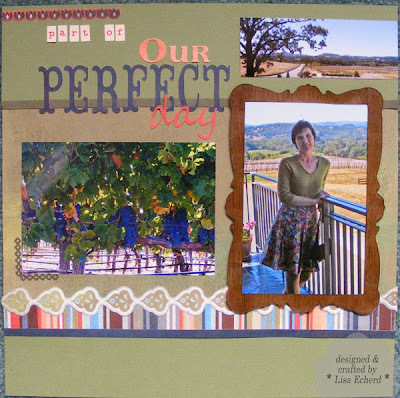 Using Shimelle's sketch for the week gave me another out for my photos by putting the title more center stage. What was important about this layout was remembering we had remembered our first date. Also, a big Thank You to Shimelle at www.shimelle.com. I won her blog candy of J'adore collection items from American Crafts. My treat package came just in time to do this layout. Be sure to check out her blog for great info and other chances to win. These tickets are my favorite things! One of the best things about blog candy is getting stuff you might not normally buy on your own. Several of these had just the right sayings. To create the background, I cut a design on the Cricut using the Storybook cartridge. Then I used the design as a mask and inked around it with Warm Red fluid chalk ink on my Riding Hood Red cardstock. It left me with a great mask I'll have to use on another layout. 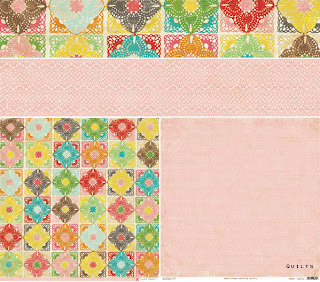 Don't forget to check out www.shimelle.com for more great pages using this layout design. Thanks for visiting today! Hope you are having a great week. 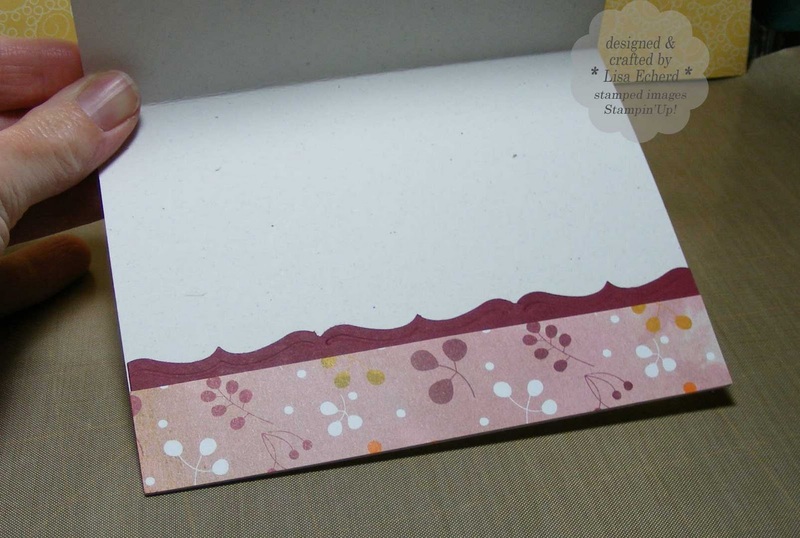 Cardstock: Riding Hood Red by SU! The flower is made from some discontinued sheer fabric. I plan to do a video on this type of flower once I've done a few more and have my steps down. So for now, let's just say that 'pinking shears' are a great tool to have. I hand cut the asymmetrical heart from watercolor paper and used Jennifer McGuire's technique for inking with watered down Ranger Distress inks. Then I stamped it with a flourish stamp in Dark Brown chalk ink. Finally I distressed the edges with Vintage Photo and just a touch of Walnut. 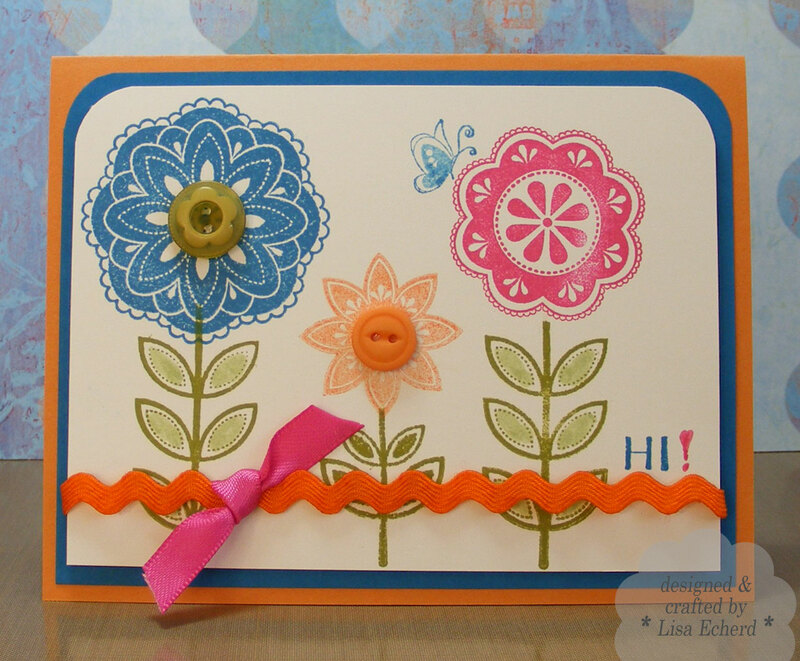 The card base is stamped with a wheel stamp from Stampin' Up! The ribbon is some more inexpensive organza from the fabric department at Hobby Lobby. I didn't work all day on cards yesterday. I spent most of the morning in the kitchen making our Valentine's dessert - a triple Chocolate pound cake! Yum! My hubby's Valentine card is one we did in Stamp Club this month with that new set from SU! that says "I would give up chocolate but I'm not quitter." Seems fitting. Hope you have a very sweet day with those you love! 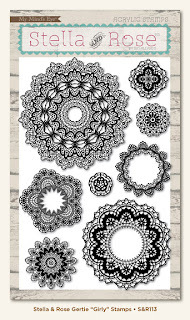 Ingredients: Stamps: Baroque Motifs from Stampin' Up! 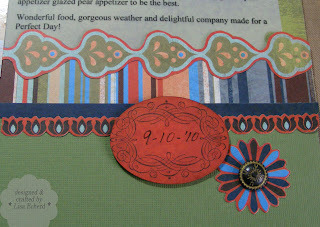 New product doesn't get dusty in my scraproom (like everything else in my house does :-) but I think I broke a record with the Elements of Style stamp set from Stampin' Up! I picked it up last Saturday morning and made this card Saturday afternoon. 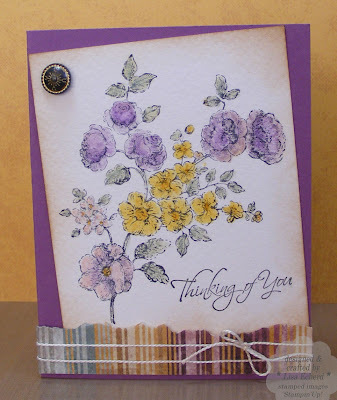 My plan for this large floral stamp was to use it as a background image and I still plan to. For it's maiden trip, I thought I'd use some watercolors in various shades of purples and yellows to match this pretty striped MME paper. Purples can be such a challenge to find so I'm always on the lookout for pretty purple paper. 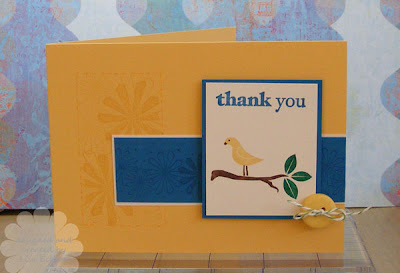 Ingredients: Stamps: Elements of Style, Kind and Caring Thoughts (greeting) by Stampin' Up! On this bright sunny day, it seems ages since I stood on the porch and watched my first white Christmas unfold yet it has only been a few weeks! It certainly was a gorgeous snowfall. We just loved watching it come down. I have a couple more pages to finish up 2010. For this page, I used older techniques of matting photos and scattering them around the page - sort of like snowflakes, I guess. 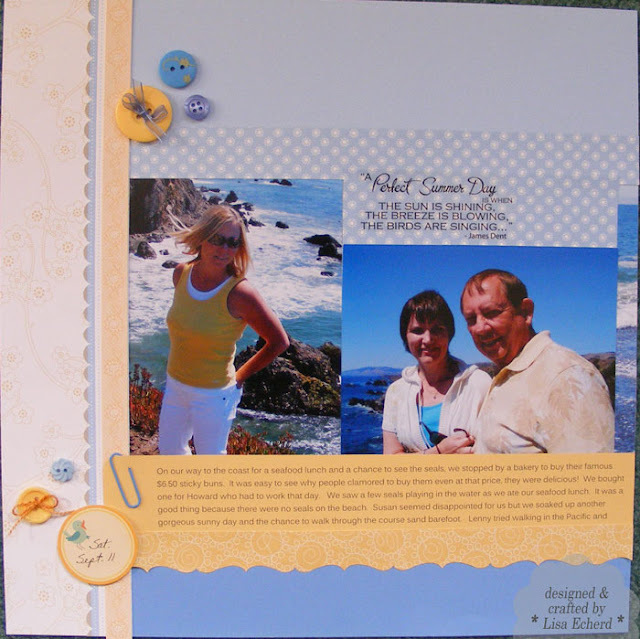 It was mainly to make the transition between these very grayish photos which are actually printed in color and the snow sprinkled background paper. I finally brought down the last decoration boxes out of the attic this week and just haven't had a chance yet to pack up the mantle garland. I know when it is gone, I'll really be looking for spring. The award encourages me to tell you 7 things about myself and then pass along the award. 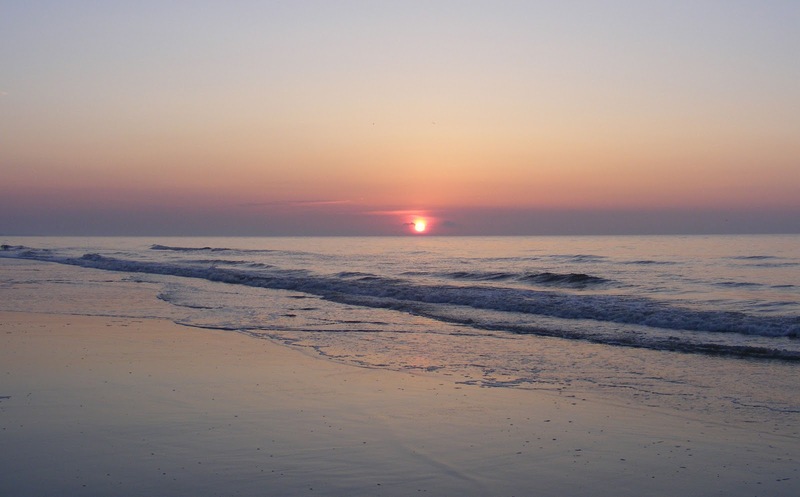 I love to travel to new places but my favorite place in the entire world is the beach of Hilton Head Island on a warm day. Ironically, I do like to organize spaces. Cleaning out the closet is very gratifying to me. When I was a child, I dreamed of becoming a great singer - until I got my first tape recorder when I was about 12. I sound like that??? Really??? I can answer almost all the "US Presidents" questions on Jeopardy. I know little about sports and nothing about mythology. I may be one of the few women in the world who hates shoe shopping. It has only gotten worse as my feet have become increasingly particular in their middle age. Actually, my feet seem to think I'm at least 80! I'm perfectly happy to stay home Valentine's Day, watch TV and share a dessert. I think this year we are going to watch the IBM Jeopardy tournament. My husband thinks that makes me the perfect wife. Let's not disillusion him with my house keeping confessions, shall we? Never mind, he actually dusted the end table by his chair the other day himself saying even he could tell it was time so I think he knows he didn't marry Martha Stewart. Be sure and visit their wonderful blogs! I've been seeing all these great accordion style flowers on layouts and in scrapbooking product and wondered if I could make my own. YouTube to the rescue! Yes, you can make them. They are a bit tedious though so it is something to play with and then decide if you want to make or buy. Of course the advantage to making your own is to make whatever size you want with whatever paper you already have. When making my flowers, I did 1/4" pleats and 1/2" pleats. 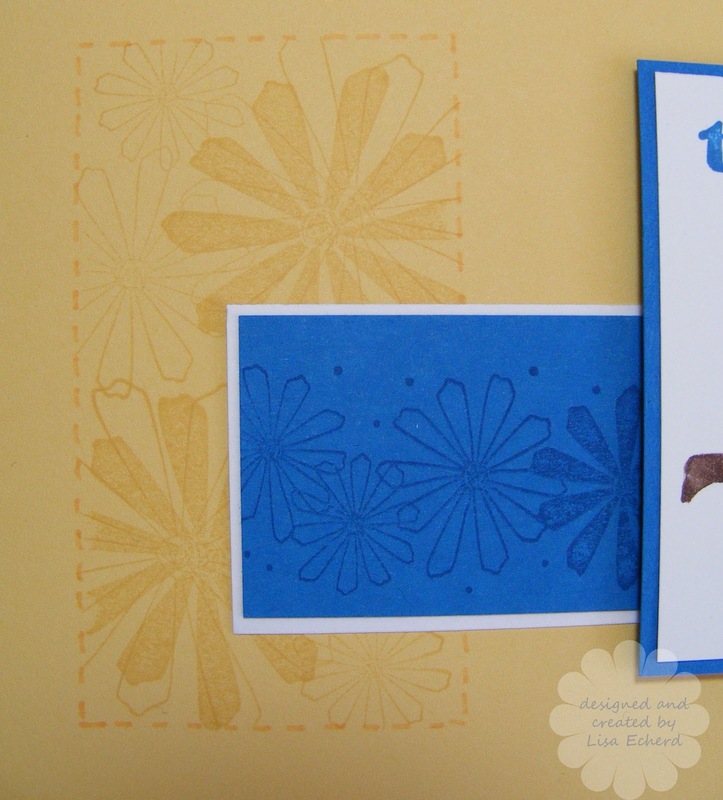 The 1/4" made very sturdy flowers that create a thick but not unmanageable layout. The 1/2" ones were just awfully thick particularly if you want finish off with a button in the center as I did. So I did a little extra snip with the scissors and that is what I'm showing in this video. I actually ended up making the entire flower on the video. If you want to see the extra bit only, just fast forward to about 4 minutes in. 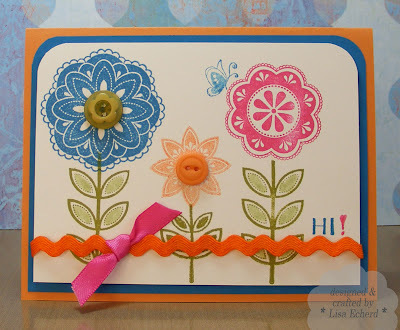 The white stamped circles are painted chipboard stamped in Craft ink with the Big Flower's stamp set from Stampin' Up! I snipped my scallop circles to give them a little extra dimension. This was one layout where I could see the advantage of a digi scrapper. 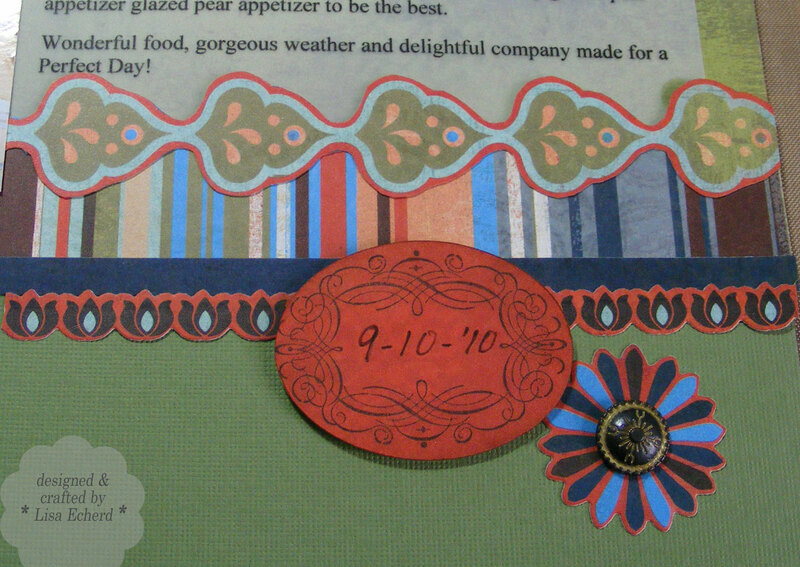 I must have tried a half dozen background combos before I decided on the Doodlebug paper over the orange. All that meant those flowers got moved off and on a zillion times. I wish I'd photographed this layout before adding the small darker blue buttons. 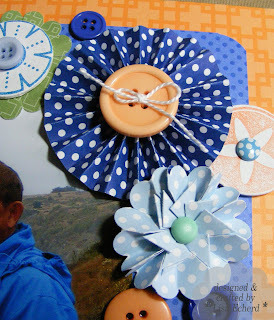 Those buttons are the smallest element and they made the most difference in bringing it together! Here is one of the videos I watched on a basic Accordion Flower from dahlhousedesigns: That's How Thursday Another one I watched used a glue gun for the adhesive. If I wasn't a total klutz with the glue gun, I might give that a go. Ingredients: Stamps: Big Flowers by Stampin' Up! These were made with one of my favorite Hampton Arts sets- Fabulous Flowers. For some reason they really call out for bright colors so I stuck to the Brights color family from Stampin' Up! Staying within a color family was another way to get things going without spending a lot of time debating color choices. The base cardstock is one of the In Colors - Peach - because I didn't have that much Tangerine Tango. 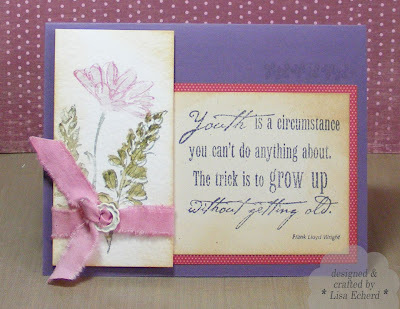 After this card, I did another and then worked on a scrapbook page that should be up tomorrow. Something else that needs a little kick but won't be nearly as easy is my New Year's resolution. I "got moving" some in January but not nearly enough. So today, I'm recommitting. Keeping a record really helps. I found myself pleasantly surprised at how much crafting I did in January. My quick daily note of my "get moving" resolution revealed about an even split between days I met my commitment, met half of it, and days I didn't do anything! I did work a lot more in the evenings last month but I told myself from the beginning I would not let work count as extra moving or as an excuse not to do anything. So I'd better get started. Hope you will stop by tomorrow. I'll have some accordion/pinwheel flowers up for TIPsy Tuesday. Have a great day! 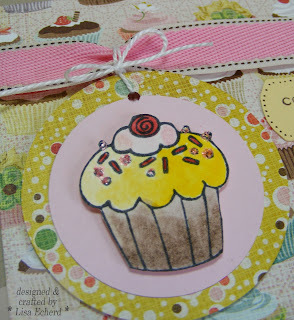 Here's the last of my Basic Grey Nook and Pantry Paper Pad using my favorite paper of all - the cupcakes. 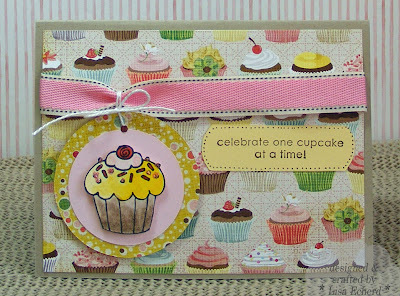 I also used a Hampton Arts set to stamp the companion cupcake with sprinkles. I love Hampton Arts stamps and am going to have to find more sources for them. They have very good image quality when stamped and the don't stain at all. I've also found they work with many types of ink equally well. Hope you have a very sweet day. Thanks for stopping by! 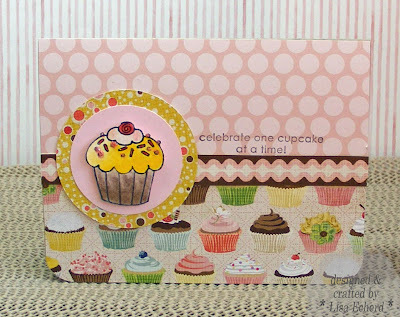 DSP: Basic Grey Nook and Pantry 6x6 pad, Blush blossom from Stampin' Up! As you might guess from yesterdays post, I've been working to move a little product out of my scrapbook space. Why? Because I want to enjoy the serenity of those empty drawers. Ha, NO! Of course not, I want to buy more pretty papers and goodies! 3. Over at Crate Paper, I'm torn between Emma's Shoppe Collection and the Portrait Collection or getting the Restoration collection from last time that I never bought. It seems every time I click on a layout I like in a gallery, there pops up the Restoration collection again. So many beautiful papers and embellishments here. 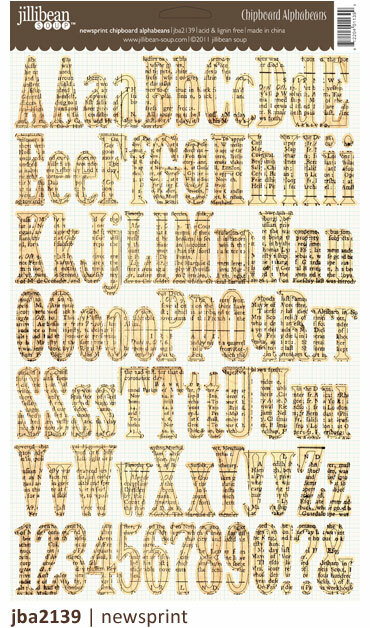 This is a paper from Emma's Shoppe. Isn't that just delightful! 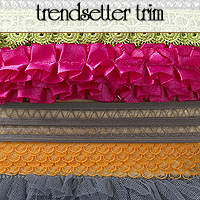 I'm definitely seeing a trend in products, like clothes, toward the feminine looks. Lots of lace, ruffles, and beads. Pretty, pretty! It will be interesting to look back on this later in the year and see if really bought these things or changed my mind a dozen more times. 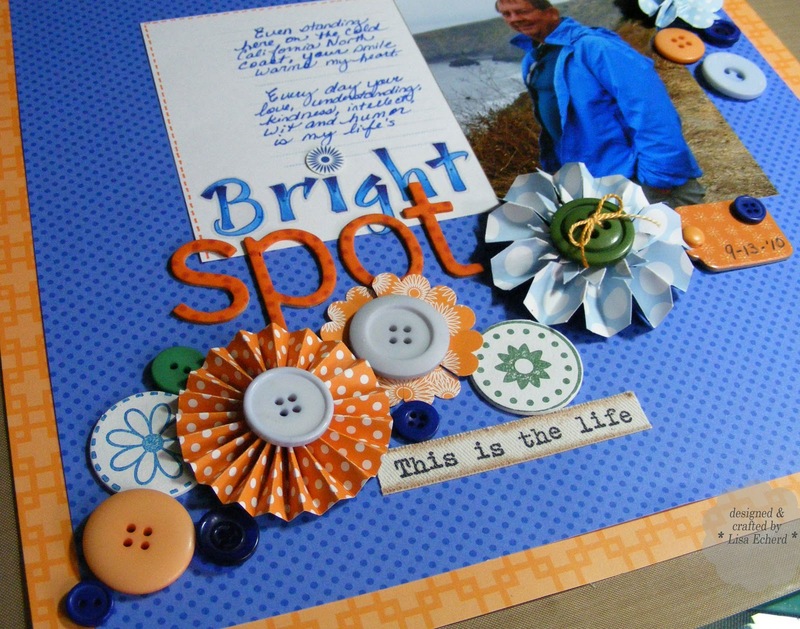 What do you have your eye on for spring crafting? Are you like me? 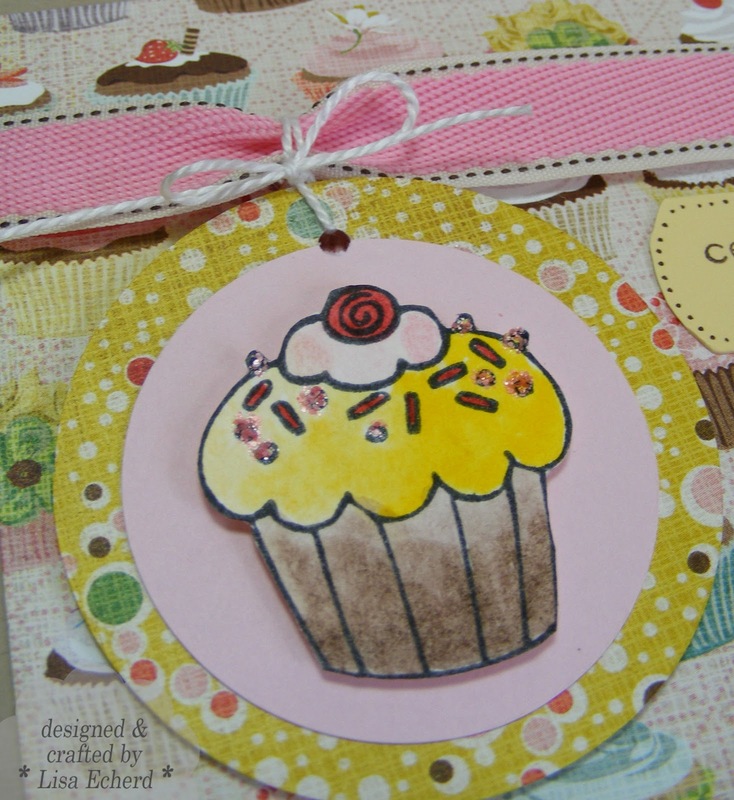 Do you crave new designer papers, pretty ribbons and more and more chipboard even though the cupboards are a bit full? 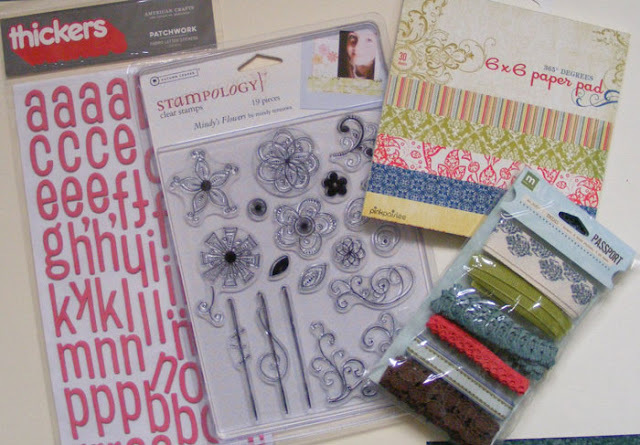 Many new papers are on their way to our favorite scrapbooking retailers this month. I just can't resist a few new papers and ribbons even though I still have some older collections. Some of my collections are also well used so there just aren't that many papers - certainly not whole sheets left. But I feel so guilty just throwing out that lovely paper I once craved! 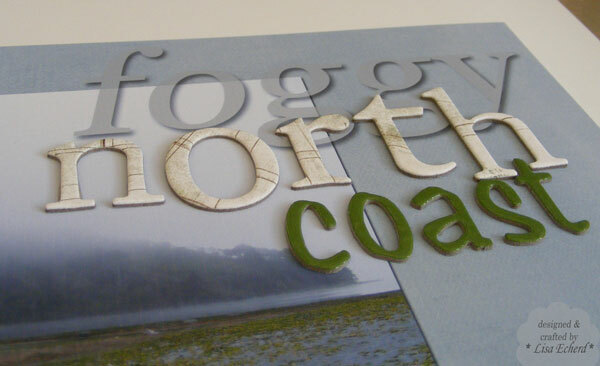 And embellishments, too, get used partially up particularly those chipboard letters. What to do with the remainder? 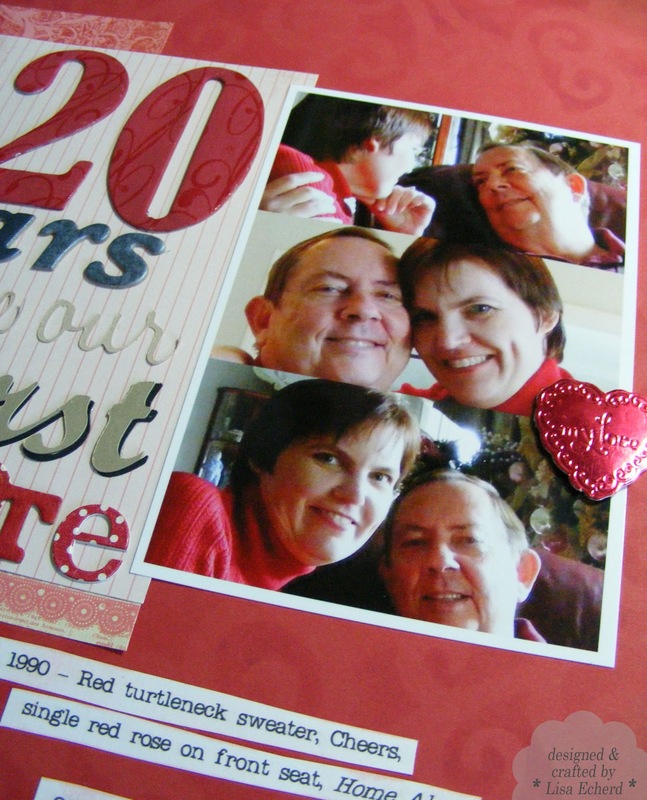 If you are normally a scrapbooker, make cards! 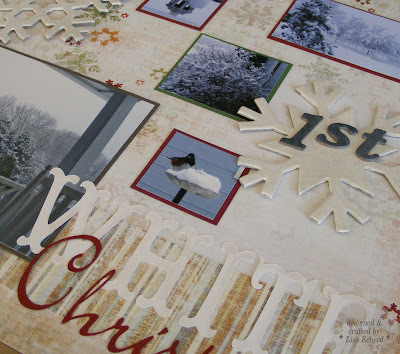 It is a great way to use up scraps or sheets of paper that just didn't work for a page. 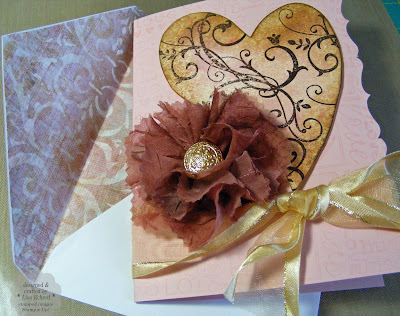 Use extra DSP to line a matching envelope for an extra special card. Divide and conquer! I normally keep paper by collection but eventually I'll take the whole sheets I want to keep and put them with another collection they coordinate with. Mixing collections really breathes life into your stash. Scraps can go in a bag to give away. Look at the B sides of your holiday papers, can they be used for general purpose? 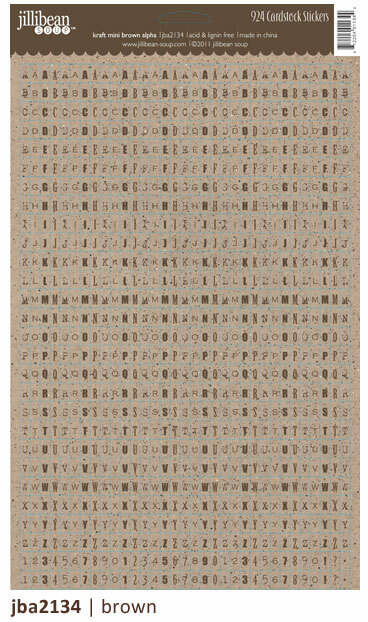 Also, I have some of my older chipboard alpha sets arranged by letter rather than by set so I can do a mixed alpha title. Give away to friends! At your next class or crop, bring along a bag of goodies to share. Or do you have a friend who might put them to good use? I have a friend who does remarkable cards from the tiniest of scraps and found items. Donate. Find a teacher or school that wants some free art supplies. Caution: I would not give away to preschools personally. A lot of embellishments just aren't made for little ones to handle. 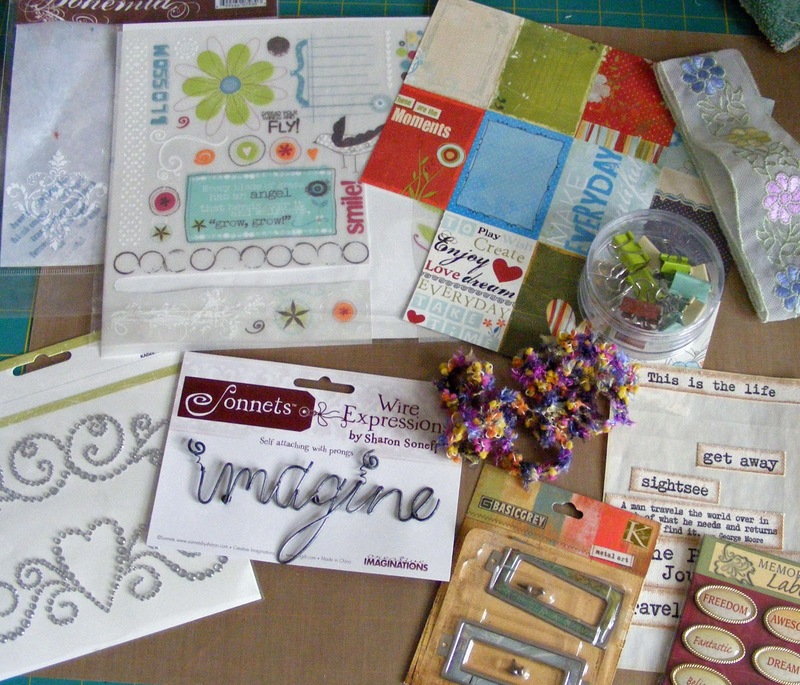 Make your own scrap box for your die cutter, Cricut or Silhouette. Aren't you always needing to test a cut shape to see if it is the right size? The photo above are some items that I've had for years - some well used, and some never out of the package! Later in the week, I'll share the finished layout using some of the supplies above. I have something very shabby chic in mind so I can use lots of things from different manufacturers and styles.